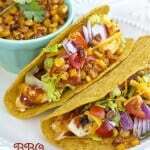 These Barbecue chicken tacos are full of flavor and come together easily making them perfect for busy nights. Line an oven safe pan with foil. In a small bowl, mix seasonings. Rinse chicken and pat dry. Rub first with olive oil, then seasoning mix. Place chicken in the foil lined pan and bake for 15-20 minutes, or until chicken is cooked through and juices run clear. Baste chicken with barbecue sauce then place under the broiler on high for 5-7 minutes. Watch carefully so the sauce doesn’t burn. Heat taco shells in the microwave. Slice chicken and place a few strips in the bottom of warmed shells; drizzle with barbecue sauce. Assemble tacos with your favorite toppings.